The easy parking and quiet campus on Fridays are great, but the lack of on-campus food options makes finding lunch difficult. The three food trucks that are on campus Monday through Thursday are typically not around Fridays, despite there being 92 Friday classes this semester, according to the school’s schedule. The college should figure out a way to guarantee that the food trucks will be on campus on Fridays, so the hundreds of students, faculty and staff have somewhere to eat the last day of the school week. Food options at Pierce are already limited Monday through Thursday. The college’s cafeteria, which was finished in 2013, sits empty. The Freudian Sip café offers paninis, pizza and pre-packaged sandwiches and salads, but is more often than not out of those items by the end of the week. The three food trucks, Falafelicious Catering, Hot Sauce Truck, and Hot Coffee Catering fill the gap Monday through Thursday, but are rarely on campus Fridays. The lack of food options means Pierce is similar to a food desert, which the United States Department of Agriculture defines as a neighborhood or town that does not have easy access to affordable, fresh and healthy food. 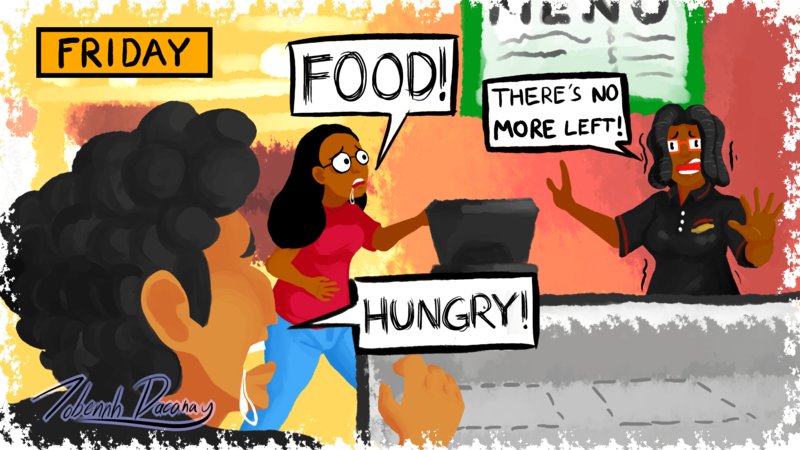 There is a neighborhood of food around the campus, but it takes time and wastes gas to walk from class to the parking lot and drive to the nearest sandwich shop or salad bar. The Los Angeles Community College District renewed the food trucks’ contracts through the end of this semester in December, 2014. They should have required a stipulation in the contract that food trucks must be on campus on Fridays through at least 1 p.m. They could have cost-averaged the dollar amount of doing business during the week with the below-average sales the trucks do Fridays. This might not make the trucks much money, but it would give the people on campus immediate food options. Other L.A. community colleges have on-campus food options on Fridays. For example, West LA College’s cafeteria offers its entire menu, which includes breakfast, burgers and Mexican food until 1 p.m. on Fridays. If the district leaves Pierce’s cafeteria empty for another semester, it should at least require the food trucks be at Pierce on Fridays through the early afternoon.